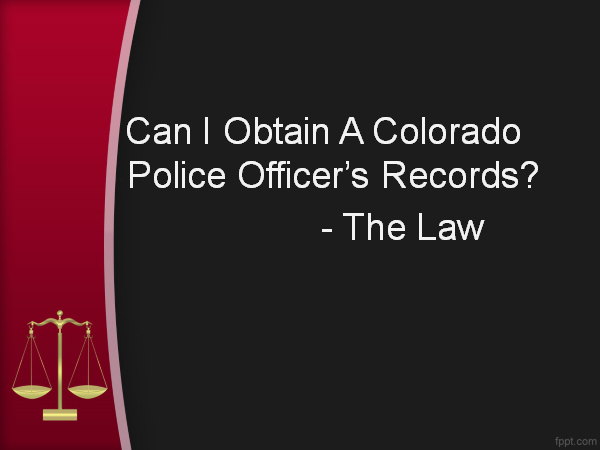 Can I Obtain A Colorado Police Officer’s Records? – The Law – When a person is charged with a Colorado violent cime such as Second Degree Assault On A Police Officer – the defense may be self defense that is – the officer used excessive force. In these cases is maybe critical to obtain the officer’s professional history of possible past complaints and internal affairs investigations lodged against him or her. Obviously, and with understandable justification the police fight hard to prevent the disclosure of this material. This article addresses the Colorado law in this area. When a police officer has been caught lying in a police report, or it is disocvered that he has viciously and unnecessarily assaulted others in the performance of his duties, it is clear that he has placed his professional history into play. An experienced Colorado criminal defense lawyer, upon learning this information (se Brady Disclosures below) should then file a Motion to Disclose that officer’s personnel file. After the Motion and Subpoena Ducas Tecum is filed – be prepared for a long and difficult fight. To obtain these records the Defense must demonstrate the relevance and materiality of the information in advance to overcome a police officers right to privacy. If that is done to the satisfaction of the Trial Judge – there is usually a procedure where the judge will review the materials privately (called an in camera review) and then – upon disclosure of the relevant materials (if they exist) order the limited disclosure and use of the records to the materials released. It is rare that the entire file is just handed over to the Defense. Furthermore, a protective order as regards the use of the personnel file is often ordered should any of the materials be disclosed. The law in the area of the privacy rights of a police officer is governed by a very well known “right to confidentiality” Colorado Supreme Court case – (and the cases decided thereafter ). That case is Martinelli v. District Court, 612 P.2d 1083, 1091 (Colo. 1980). The Court’s will not permit what Judge’s love to call a “fishing expedition” into an officer’s private files without a substantial showing of proof. (5) that the application is made in good faith and is not intended as a general fishing expedition. To succeed in a Defense request for Colorado police personnel records, the request itself must be more than an allegation that there may be information contained in the police officer’s file which “could be” relevant to the Defense. Furthermore – if the records sought are protected by a privilege or right to confidentiality, the requesting party also must make a greater showing of need for the information. The balancing act of the officer’s privacy versus the need for the information – becomes more difficult for the Trial Judge. The “Brady Rule” requires the prosecution to disclose favorable evidence that is material to the defendant’s guilt or punishment. Brady v. Maryland, 373 U.S. 83, 87 (1963). 3) that the suppressed evidence was material to the case at hand. Even when the Defense is “tipped off” to exculpatory information in favor of the Defense case – even when there is potential that this Brady Material could lead to further relevant and usable material in the a police officer’s files – the Defendant must meet a burden of showing how any of the information contained in the Officer’s files could would override a Policer’s Officer’s privacy interest in the Officer’s records. The right of Police Officer’s confidentiality to his personnel records is not absolute. Courts must engage in a balancing process when applying the right in a specific case. (3) if so, whether the necessary disclosure will occur in the least intrusive manner. (2) that the material or information which the officer seeks to protect against disclosure is “highly personal or sensitive” and that its disclosure would be offensive and objectionable to a reasonable person of ordinary sensibilities. 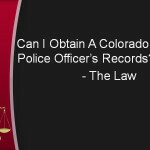 Can I Obtain A Colorado Police Officer’s Records? - The Law - When a person is charged with a Colorado violent cime such as Second Degree Assault On A Police Officer - the defense may be self defense that is - the officer used excessive force. In these cases is maybe critical to obtain the officer’s professional history of possible past complaints and internal affairs investigations lodged against him or her.